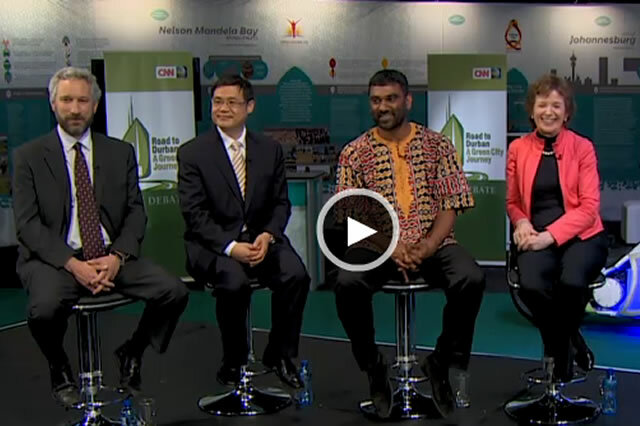 Mary Robinson Foundation – Climate Justice | Can we afford eco-cities? Durban, South Africa (CNN) – Making cities greener “actually makes a lot of sense” in spite of the economic crisis, says former Irish President, Mary Robinson. Robinson was one of four leading climate change thinkers discussing how viable it is to invest in sustainable cities in a debate hosted by CNN’s Robyn Curnow during the 2011 U.N. Conference on Climate Change last week in Durban. Joining Robinson on the panel were Pan Jiahua, advisor to the Chinese delegation at the conference, Elliot Diringer, former adviser to the Bill Clinton’s U.S. presidential administration and Kumi Naidoo, executive director of Greenpeace International.